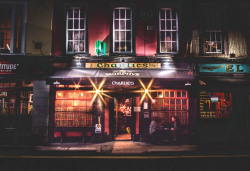 Charlies is a famous early morning Cork bar, full of character and characters. Opening every morning, except Sundays, at 7am this is the closest youll get to round-the-clock craic in a traditional Irish bar and its welcoming coal fire. And if you thought it was fun before the sun goes down wait until the guitarists, fiddle players, drummers and singers turn up! We host some of the best local, national and international acts from rock n roll and blues at night to traditional Irish music and folk acts on Sunday afternoons. Check out this months lineup below. Opening hours for ALL Bank Holiday Saturday's and Bank Holiday Monday's is 7am. One of the longest traditional music Sessions is in Charlie's bar every Sunday at 3 pm. The Session is hosted by Cork's own Sean O'Driscoll, both a sweet and rhythmic bango player and a fine hand on the old style button accordion , along with his wife Mary O'Driscoll on the fiddle. To keep the Sessions fresh and real, each Sunday features a different guest musician, an ever changing array from some of Cork's and Ireland's finest traditional players. It is equally popular with musicians, listeners and tourists with Sean keeping the Session friendly and fun but also making sure to keep the music swinging. You never know who will turn up for a few tunes, for the chat and the laughs, to sing a song or just to listen and have a few pints. It's never dull. The Bad Boy Blues Band plays a cross section of Original blues, Muddy Waters along with songs by Rory Gallagher, Jimi Hendrix, The Rolling Stones and Elvis Presley. They will have you on your feet. Hank Wedel and Ray Barron have been playing in Charliesbar on Union Quay since 1994. 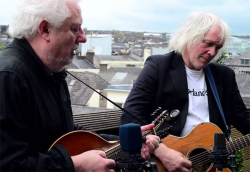 An acoustic guitar/vocal and mandolin duo, they host a Sessions that's has acquired legendary status in Cork, with musicians and singers from near and far joining them through the years. Hank sings and plays guitar, Ray plays mandolin and the pair play everything from Bob Dylan to Finnish Waltzes. A gig not to be missed. 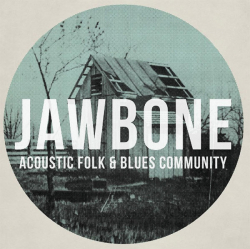 Tasty Thursday's Sessions - Jawbone an acoustic folk and blues with your host Phil Christie and Alan Comerford. They are often joined by a host of guest performers playing all things blues, country, rock 'n' roll and bluegrass. These are skilled musicians and though they play covers the sound is very much their creation. With inklings of rock, country and bluegrass this is perfect pub, tap your toe along stuff. Hot Blooded Animals started life as the backing band for legendary American country star Dwayne Dwight. A real good time classic rock group with years of experience of playing both nationally and internationally and are armed with a jukebox sized catalogue of tunes that are all preformed with plenty of gusto. They play the kind of rock 'n' roll cover songs we can all relate to. The first Tasty Thursday of every month. The Last Word are a collective of gnarled Cork Session Musicians assembled by bass guru and aficionado of groove Noel Barrett to play an inspiring selection of lesser known soul and R & B cuts from the 1970s to present day. Paul Seymour (keys), Sean Murray (guitar) and Fionn O'Ceallachain (drums) round out of rhythm section with up and coming soul diva Dearbhaile Maclean taking centre stage on lead vocals and Sarah Hickey on backing vocals. The Watermelons are a 3 piece Blues band based in Cork. With a line up, consisting of drums, bass, guitar and sax, the band boasts some of Cork's finest musicians. The set journeys from Chicago Blues to blues rock containing blistering tracks from Muddy Waters, Howlin' Wolf, The Allman Brothers, Junior Wells, Fleetwood Ma , Jimi Hendric etc. Expect many solo's driven by a formidable rhythm section. Crazy Chester have been rocking County Cork for some time now, as all you Johnny Cash, Niel Young and Bob Dylan fans will already be well aware. The band describe their style of music as Americana and country. Their original songs are reminiscent of such bands as CSNY and the Band. Renowned for their lively and entertaining live shows, Crazy Chester also have the musicianship and strong catalogue of songs to separate them from many of the other good time cover acts Crazy Chester are; Darren Grimley (vocals, guitar) ,Robbie Barron (guitar), David Jones (drums), James O'Sullivan (bass) , and Sonny Greenwich jnr. (Mandolin). Hot Guitars - This five piece bands blues, rock style is popular with young and old audiences as they play a variety of covers ranging from The Rolling Stones, The Animals, Dylan, Muddy Waters, Clapton, Van Morrison, Steely Dan and more.Fronted by lead singer Joe O'Callaghan who is also an accomplished harmonica, sax and keyboard player. Joe's high energy performance ensures that audiences are dancing from the very first number. They are rich in talent from skilled guitarists Tom Stephens and Tony Burke whom lend to the great vocal sound of Hot Guitars topped off with the unique bass playing of Pete Brennan. A gig everyone talks about. Open 7 days a week from 7am (12.30pm on Sundays).